Review: "Percolate combines two tools in one and does what others can’t." We use Percolate for the Marketing and eCommerce team, primarily for campaign planning, digital asset management, and social publishing. As our internal processes have changed, it’s challenging to go back and rethink how to manage a process with the updates available. Percolate no longer supports social listening. You can export marketing campaigns in PDF format, but not in Word. They need to be converted. We originally purchased Percolate as a replacement for our social publishing tool. The fact that it came with built in campaign creation management tools was an added bonus. I would say most groups don’t focus much effort or resources on the planning piece, but it’s well worth it. Percolate Review: "Robust all-in-one tool"
My agency used Percolate to manage many social media profiles on behalf of multiple clients. It allowed us to streamline communications both internally as well as with our clients, seamlessly coordinating content creation, approvals, and scheduling. It also allowed for easy community management, with all engagement taking place within Percolate rather than across so many different individual social apps. The asset management library was particularly useful as we could store all content in one place, organized by client and into different category folders, until we were ready to use the assets. Percolate has a seamless and easy-to-use content approval workflow which makes it very easy to send and receive approvals with our clients. Percolate is enterprise-level software with a high price tag to match. It is extremely robust and flexible for large agencies or those managing a lot of accounts with many contributors, but might not be the right fit for smaller agencies. As mentioned previously, Percolate would be a great solution for large agencies with many clients and internal/external contributors. It's a great central 'hub' for content creation and collaboration, removing the need for hundreds of emails back and forth and preventing older versions of content being scheduled accidentally. However, smaller agencies/companies might find it more powerful than they actually need. There were attributes and functionality that my smaller sized agency simply didn't end up using. Percolate Review: "Horrible Tool, but Cheap"
Percolate was used by all global social media marketing teams and customer support agents within a specific brand at my organization. The other part of the organization was using a different scheduling/ listening platform that I prefer and had our entire company shift to. We used it to schedule social media content/ outline calendars, review social data and handle community management. Calendar scheduling was okay. Not very different from other tools. Analytics exists. Data was hard to find, but there was the ability to create custom metrics. The people at the company seemed nice. Data is a mess. So unreliable. Takes so much time to create a concrete report. There is no ability to export anything. No calendar PDFs, no data Excel sheets, nothing. Hated their listening tool abilities relative to other tools I've used. It's cheaper than other tools, but you pay for what you get. Do not recommend unless you're a smaller company or have a lower budget and just need to get started in having a more organized tool for scheduling, data, etc. Percolate Review: "Favorite social management platform"
The marketing team uses Percolate as a way to organize our social media strategy across the various platforms that we post to. It has been extremely beneficial as well as time-saving in that we are able to post to multiple platforms at once all using the easy user interface. Percolate is perfect for a social media manager or strategist that needs to effectively publish and curate content. Percolate may not be best suited for those that are looking for a robust amount of analytics in order to justify the use of certain platforms, etc. Review: "Percolate: Your BFF for Social Media Management"
We use Percolate in the marketing department of my company for all social media planning and posting. It is only used by our department but we manage all the social profiles for the company. The insurance industry has a lot of red tape and we have to send all marketing materials for legal compliance approval so the approval workflow feature in Percolate allows us to create and schedule social posts and send them through an approval process right in the program. Approval workflow feature is simple and easy to use. The calendar feature is great because it allows us to see everything we have approved and ready to go for a particular week or month. Creating and scheduling posts is simple and the interface is easy to use. We have had a lot of trouble with the images previewing correctly when we are in the approval workflow. Even when they are sized down correctly, they take forever to load and we tested several browsers and had the same issues. When we export our log of approved and published posts, there is no way to export the destination link that was included with the post. It exports the percolate permalink but that requires the user to go back into Percolate, wait for the preview to load and THEN you can click and see the destination page. It would be much more efficient to include the destination URL in the reports functionality. Percolate is great for managing your company social media profiles, posting updates and using a variety of workflows for approval when necessary. The calendar feature is great if you need to view longer date ranges at one time. If you are only managing 1-2 profiles and don't need any type of approval process, you could probably use Hootsuite or another free software platform. But if you have many profiles to manage and post from and need approval workflows, Percolate is great. User Review: "Percolate makes it easy and organized"
Percolate is being used by our marketing department to create marketing plans, share files, sync information, create a social content calendar, and manage social accounts. Right now we have about 7 people on our team using it. It helps us stay organized and it really helps us keep track of our marketing assets. It has a great visual calendar. Search in general could be better. I would love to search through social posts I made using the verbage in the post. Sometimes making a simple post requires so many clicks. Percolate is great for a team that is constantly creating new marketing plans that need to be shared with lots of people. It is also very useful for a social media manager that likes to see all their content on a beautiful calendar. It is way more than you need if you are just looking for something to schedule social content with. User Review: "Percolate for life"
[It's] used for social media image sourcing, scheduling, and brief development. [It's] used by other departments within the organization for easier collaboration. The best at sourcing stock for a wide variety of travel destinations. Reliable scheduling for Facebook & Instagram. Easy to update and share calendar items. More options for viewing asset information before adding to library. Being able to edit briefs live with other users. Social media sourcing and scheduling. Sourcing no brand long form content. Percolate Review: "A Comprehensive Solution to your Social Content Management Needs." Create social content from briefing all the way through to the approval process. Social planner for managing topics and content streams across multiple channels. Image library (with cost-free access/rights to stock photo libraries). Frequent updates to the platform. At times the platform can be buggy. Analytics tool could be more robust. Would be nice to have a stronger social listening component. It is absolutely phenomenal for global social management. If you are wanting to provide a center hub for oversight that can assist other markets with content, approvals and idea generation, then Percolate excels in that area. Overall, it is also a very cost efficient tool given other competitors in the category. The platform is also well-built to suit an "all-in-one" workflow solution. With lean teams, Percolate can be the single go-to tool you need for planning, publishing and reporting. The built-in asset editor and approval process really takes the burden off juggling lots of different types of software and/or email. Review: "Percolate - has promise, but could be better"
Percolate is currently used by our marketing department for scheduling and tracking on everyone's calendars. This tool is also used for social post scheduling and queuing. Percolate also can create campaign specific calendars for every individual in the team. I would say 7 as it has a lot more scope for improvement. First off, it is slow to load and navigate among different tabs. Functionality to customize is limited and you really can't do much without an account manager helping you for little customizations. The area it does well is in social post scheduling, similar to what Hootsuite does. It has a section called Brew, which suggests to you the latest news based on the categories you choose, and then you are able schedule/share those posts to your social channels. Review: "Percolate Makes Social Media Scheduling Across Teams Easy"
Percolate is used across the marketing, communications and grassroots fundraising teams to schedule social media content, organize campaigns across teams and gain approval for social content. It is used primarily by the marketing team and members of the grassroots fundraising team who schedule social media content. We also use it to store photos and videos and discover content through the tool's Twitter discovery option. Percolate has a great image editor that makes it easy to create images that are the correct size for social media. Percolate's comment feature makes it easy to communicate with other team members about a post. The Percolate team often updates the product to keep up with changes and new features from social networks. Functionality can sometimes run slow, especially when new features are introduced. Though Percolate tries to keep up, it is occasionally slow to add new features along with Facebook, for example creating carousel image posts. Icons are not intuitive, so there is a learning curve to use all of its functionality. 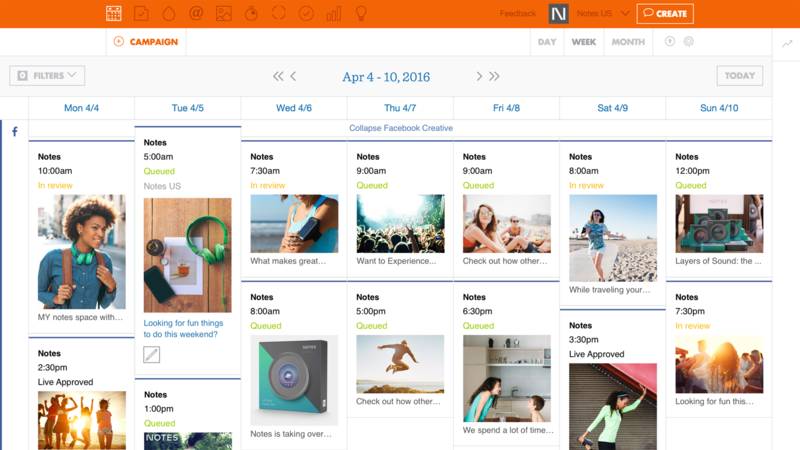 Percolate is very useful for social media scheduling across channels. It also offers an easy way to communicate with colleagues about social posts and gain feedback and approval. It also has a useful photography app that allows you to easily have someone fill out a photo consent form at events, which has been helpful for our communications team as well. Percolate Review: "Everything a community manager needs to create and manage content." In 2013, we made the decision to split out social publishing tools into social care, and social content. As part of this split, we migrated off Hootsuite and into Sparkcentral and Percolate. Percolate is our central content publishing platform where we manage our content, plan upcoming content, find new content for our brand, manage all of our multimedia assets, and manage a central content planning calendar for all of the outbound channels a social media manager usually takes care of. In our care, this means events, Facebook, Twitter, LinkedIn, Google Plus and our blog. Additionally, Percolate interfaces seamlessly with our corporate Wordpress blog, allowing content to be published not just to the usual social channels, but also to the blog. This greatly reduces the amount of work required to push create, edit and publish our content. It also allows us to create blog content, and immediately schedule sharing the post in social. The Percolate Brew feature has a human powered "learning" tool that learns about the kind of content our brand publishes. Using that, it provides tips and sources for new content. Each morning, we receive a list of content from around the world that is relevant to our brand and worth sharing with our own audience. The ability to create one piece of content, and then customize it for our various channels is a real time saver. We can write an article, then easily create a shorter version for Twitter, or a more B2B focussed piece for LinkedIn. Percolate helps our content creators decide when to post content - its posting schedule tool makes sure you don't overpost, but can also intelligently decide on a better time to post something based off past results. A lot of the features in Percolate are very well built, but only provide the bare minimum as features go. Its editorial calendar for example lacks export/import features and its multimedia repository only supports images. In many ways, Percolate is trying very hard to be too much at the same time. At the moment, Percolate lacks user level management. We can add users who need to be moderated before posting, but it is for example not possible to add users just for one specific function (like the multimedia database). If you are a community manager or social media manager looking for a tool that focuses solely on content creation, Percolate is a perfect tool. Unlike most other tools, Percolate provides everything you need to build visually appealing content. This includes access to Getty Images, Shutterstock and your own built in media database with no limits on image storage. The tool is less suitable as a listening/response tool (like Hootsuite), even though it does have support for this built in. Percolate also provides excellent feedback on the results of your content, so you can see how well it did based off the metrics that really matter; like, reach, shares, virality. The content creation tool even includes a built in image editor that offers brand friendly tools like logo drop-in, titles using your brand font and colors and other handy tools. These are often things that would need to be outsourced to a creative team, but can now be accomplished in under a minute. The vendor includes a multi-stage onboarding procedure which starts with your account manager, followed by a brand onboarding tool and other online tools to learn about your brand voice and brand creative guidelines (like colors and logos). The end result is a tool that "knows" who you are. Percolate says it sets the standard for content marketing software, by providing companies with the most complete platform for content inspiration, creation, management, distribution, measurement, and more. The vendor’s value proposition is that with Percolate, content teams work smarter and faster, turning stories into sales and great customer experiences. Percolate was the only software company included in Fast Company’s latest “10 Most Innovative Companies in Marketing and Advertising,” and was also named the “Clear Leader” by Forrester Research in their most recent study of content marketing software tools, The Forrester Wave™: Content Marketing Platforms, Q2 2015. The vendor also says 800 brands trust their technology to save time, elevate their content, and improve marketing ROI, ranging from content marketing leaders like GE, Unilever, IBM, and Marriott, to high-growth startups and emerging businesses like Lyft, Squarespace, Shinola, and WeWork.